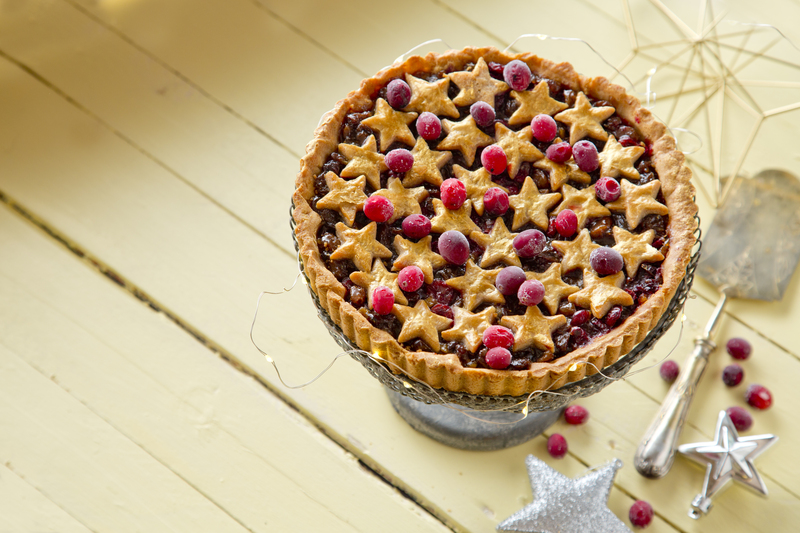 These Magical Mince Pies are packed full of flavour and bright colours. To make the pastry, sift the flour and salt into a large bowl. Add the butter and rub it in to resemble fine crumbs. Toss the icing sugar and cinnamon through. Add the egg and egg yolk and mix until it all comes together as a smooth, soft dough. (For speed, this can be made in a food processor.) Knead the dough into a ball on a lightly floured surface, flatten into a disc, wrap in cling film and refrigerate for 20 minutes. Lightly grease a fluted loose-bottomed 22cm tart tin that is 2.5cm deep and put on a baking sheet. Line a baking tray with non-stick baking paper. Roll the dough out between two pieces of parchment paper to about a 30.5cm circle that is about 3mm thick. Carefully lift it into the tin, pressing the edges down and leaving the excess pastry hanging over the edge. Trim the edges with a small sharp knife. Roll these trimmings out into a piece 3mm thick and slide it onto the lined baking tray. Cover this and the tart case and chill in the fridge for at least 20 minutes. Remove the pastry case from the fridge, line it with a piece of non-stick baking paper and fill with dried beans or pulses. Bake in the oven for 15 minutes (this is baking blind). It should look pale in colour and be just beginning to set. Remove the paper and baking beans and return the case to the oven for a further 5 minutes to let the base crisp a little. Meanwhile, using the star cutter, stamp about 30 star shapes out of the rolled-out pastry. Reserve in the fridge until ready to use. Stir the mincemeat and cranberries together in a medium-sized bowl. Spoon this into the baked pastry case, spreading it evenly. Arrange the star cut-outs on top. Brush with the beaten egg and bake in the oven for about 30 minutes, until beautifully golden and crisp. Leave to cool slightly before carefully removing from the tin. Paint the stars with edible gold paint if liked. Dust with icing sugar and serve warm or cold with brandy butter, custard, cream and/or ice cream.